Writing is good for a second career, since it’s best started after you have the satisfaction points for Creative Visionary (higher chance of writing masterwork). Writing has the Bestselling Author Aspiration and its own career (Author and Journalist branches). Completing the Bestselling Author Aspiration makes you Poetic, which allows you to write the Book of Life. You can write multiple Books. The Book of Life can only bring a sim back from the dead if it is used before they die. Use the book to Capture Epic Saga of the sim you wish to protect. After they die, use the book again to Summon them back. While the saga-captured sim is still alive, reading the Book will raise all motives to full (like a Sims 3 moodlet manager). This can be done repeatedly, but Summon consumes the Book of Life. You cannot Capture Epic Saga for yourself. Once an Epic Saga has been captured, any sim can read it. 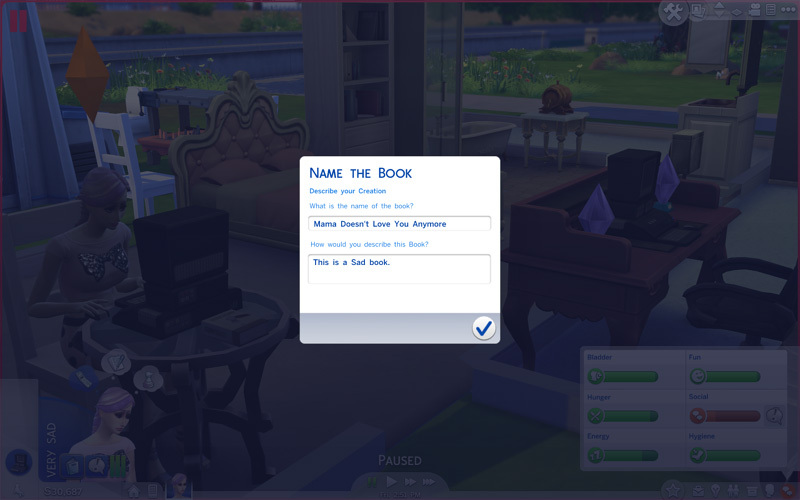 You can carry and read your own book to raise your motives (though you need another sim to Capture your Saga). It’s like cheating, but hey, you’ve earned it. Bug: When a sim dies, their inventory items goes into the household inventory. When they are Summoned, the items return to their inventory. If you have placed the items in the world, this can create problems. In my case, I placed a frog from a stack on a table and, after Summoning, can no longer move or delete that table. Reloading fixes this. The Career Achievement. Author 10 unlocks the bookshelf secret door. Books are treated as individual objects, not as individual titles. If you buy a new copy of the same title, you can Read it again (instead of “Reread”). Bookshelves come with plenty of books, so there is a constant supply of fresh books to read. Finish Reading x Books – For the Nerd Brain aspiration. You can buy multiple copies of skill books to complete this while raising your skills. 1) Your sim will not stop reading; keep an eye on the counter and stop reading manually. 2) If you read a skill book before you can gain skill from it, you will not get credit for reading it when you are able to gain skill from it (if you read a skill book and do not gain skill, sell that particular book). If you want to finish reading a book – Because reading can be multitasked with walking, your sim will often stop reading before they finish a book unless there are no pending interactions. Often, you will have to wait for them to finish before giving them new commands (and check that the book says “Reread”). The only multitask I find useful is using the toilet (queue them to sit on a chair after so they continue reading). If you are too advanced for the skill book, the skill meter will not hover over your head, and you will get a grey Bored +1 moodlet. When you Resume Writing, you will use the nearest computer, which might not be the one you triggered the action on. So if you have two computers (one for Inspired and one for Focused), Sit your sim on the chair before you Resume Writing. You might want to wait for a requirement before you publish your books. Aspiration Level 3 has “Publish 10 Books”. The Career has publishing requirements too. And of course there are publishing whims. Once published, you cannot get your book back. You might also want to keep an emotion book for the moodlet buff. You can only Submit to Literary Digest once a week, so choose your highest quality work. ♥ Creative – Randomly Inspired. ♥ Bookworm – Allows you to analyse books to get Inspired, but it takes too long. Might have passive bonuses like faster reading but Perfectionist seems better. ♥ Perfectionist – Slower writing but better books. ♥ Gloomy – Write Sad books because you’re Sad more often. And your sim mopes around and breaks into tears. It’s hilarious. But why wait for the random Sad moodlet? Just ignore your social motive. It will eventually drop to full red, giving your sim the Desolate moodlet (Sadness +3). Works for all non-Loner sims. Other default Sad books are All the Sickly Horses, No Exit Ramp, Orphan Song and One Fell Out of the Cuckoo’s Nest. Journalist: To Write an Article, first talk to a sim and Interview for Story (reveals one trait) or Interview about Life (reveals all traits). You can also Rummage for Information from other sim’s garbage cans; you need to load their lot for this. You may then Write a Positive or Negative Article on them (Computer). Writing an emotion book requires Writing 3, in addition to being in the correct mood. Being Expressionistic by completing Painter Extraordinaire unlocks all emotion books. Reading an emotion book gives +2/4hrs. You do not have to read the whole book to get the moodlet. This aspiration is difficult for some, with “Beat Writer’s Block” on the very first milestone. The problem isn’t beating writer’s block as actually getting writer’s block. You’ll need your Bladder, Hunger and Energy motives high, because you’ll have to Practice Writing for some time before you get it. The main thing is to keep writing uninterrupted and only Practice Writing lets you do that. A sim who does nothing but write will get it regularly. Spamming books won’t work once you have a few levels in Writing. After practising writing for many sim hours, your sim will stop writing. Start her up again. Keep doing this until the interaction is greyed out. 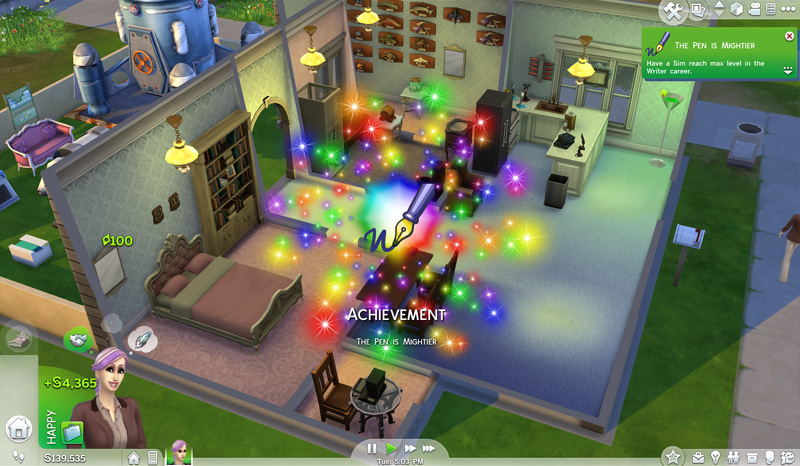 The Writer’s Block moodlet is an orange Tense moodlet. Contributions from AntagonistAgent via reddit.